The group name given to a completed build of handrails, baserails, newel posts, spindles and newel caps. This tends to be the bottom step of the staircase with either one or both ends having a rounded corner. This is the horizontal measurement between the face of the first step and the last riser. The measurement is taken from face of rise to face of rise and should be at least 220mm for domestic use. The edge of the tread which protrudes over the face of the riser and the cut string. Connecting straight lengths of handrail to fittings and ramps to take it over the top of the Newel turnings to make a continuous handrail. The angle measurement taken between the pitch line and the horizontal. The notional line connecting the nosings of all the treads in the staircase. The pitch of the stairs. 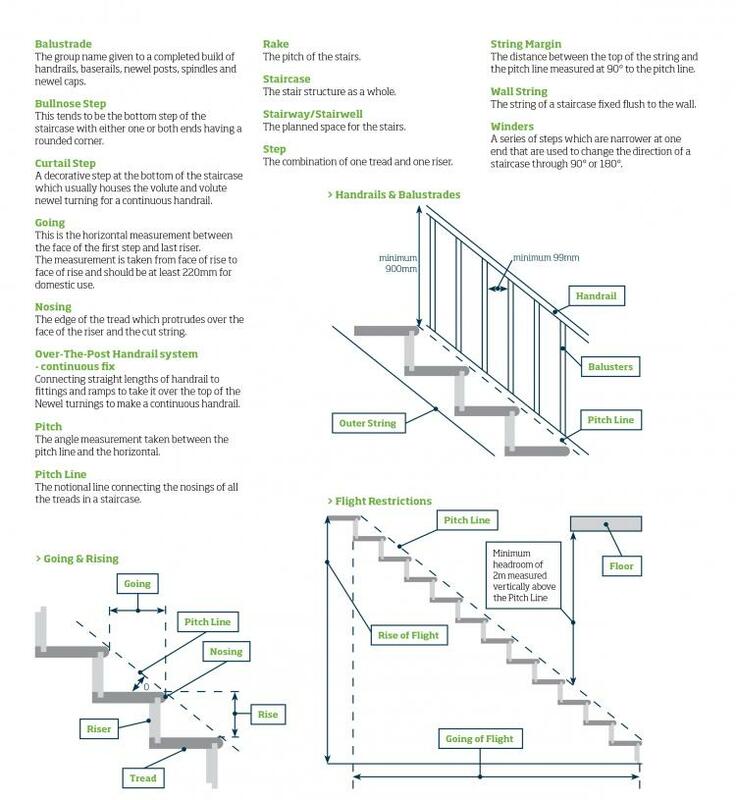 The stair structure as a whole. The planned space for the stairs. The combination of one tread and one riser. The distance between the top of the string and the pitch line measured at 90 degress to the pitch line. The string of a staircase fixed flush to the wall. A series of steps which are narrower at one end that are used to change the direction of a staircase through 90 degrees or 180 degrees. Part one of our terminology guide can be found here.